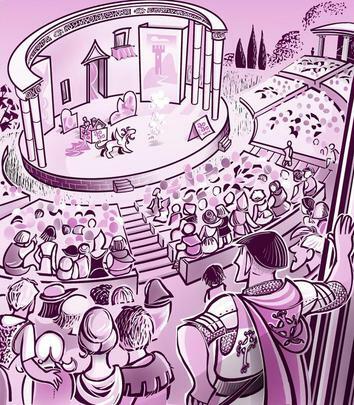 ​ The amphitheater was their largest, most elaborate stage to date, and filled to overflowing with an avid cross section of the realm's populace. Highborn and lowbrow, all eager to see the Clown and his Cat. Backstage, Jo paced nervously around the rigging, until sighting a familiar face. The knight grinned. “Alas, the dragon I was summoned here to slay is still at large after all these weeks. Though I believe the beast's days are numbered." When the curtain came up, Jo entered with a flurry of cartwheels, somersaults, flips and twists. After which he threw in a series of astonishing jigs and dance moves. He topped off the exhibition with a jaw-dropping leap high into the air, nosediving into a bouncy tumbling routine. It was an exhausting display, and by the time he finally stopped to bow and acknowledge the crowd's cheers, he already heard a chorus of voices ring out for Kitty. “Bring out the 'Cat'!” they shouted. He could put it off no longer—and neither could Kitty. She wasn't going to wait for an introduction. Upon hearing those clamoring to see her, out she jumped. Instantly the mood changed. Enthusiastic shouts turned to horrific shrieks and gasps, at the sight of the monster arriving on stage. 'Little' calico was now a massive stone-skinned lion, with a gorgon-like head, engulfed in swarms of hissing vipers. Her rough-hewn face was ablaze with eyes of green fire, two torches above a cavernous mouth with granite jaws the size of a bear trap. Not to be outdone, the Cat stormed on with a flourish, roaring to shake every pillar and post. She didn't hesitate to pounce on JoJo, slamming him to the floor, claws bared, and jaws foaming. Such a sudden turn of events appeared to shock JoJo too. He paled to look at her. He knew this wretched writhing face drooling over him—the Sphinx. Roxand!